So, you’ve decided you want to join the electric vehicle wave and get a BMW i3 or BMW i8. Or maybe you wanted something more “traditional BMW” and decided on one the four plug-in hybrids offered from the BMW iPerformance line. BMW has been, and continues to be, a leader in the electric vehicle market and is on track to sell well above the 100,000+ electrified cars they sold in 2017. Back in May, we reported that BMW had passed the quarter-million mark with electric vehicle sales worldwide, and there’s no reason to believe that they are slowing down anytime soon. In fact, at the 2017 LA Auto Show, BMW announced that they will be transitioning to their new flexible vehicle architecture, that will accommodate ICE, PHEV and all-electric versions of all future models, starting in 2020. So, with plugs cascading across BMW’s entire product line, one question that many future BMW plug-in owners will have is, “How and where do I charge the car?” Here at BMWBLOG, we have you covered, and have tested out charging stations from various makers so we can confidently recommend products that we know our readers will approve of. There are a lot of factors to consider when deciding which charging station to purchase, because there’s really no “one size fits all” solution. In the US, all of BMW’s plug-in offerings come standard with a 120v level-1 convenience charger, that will supply about 4 miles of range per hour of charging. In Europe, the convenience charger operates on the local electrical grid that supplies 230v, and delivers about 12 miles of range per hour. For that reason, many in Europe just use the supplied charging cable, while in the US most people upgrade to a higher-powered 240v level 2 charging station for home use. We’ve previously reviewed ClipperCreek products, which we’ve found to be high quality and a good value. Another brand we’ve come to appreciate is eMotorWerks, makers of the JuiceBox line of electric vehicle charging stations. 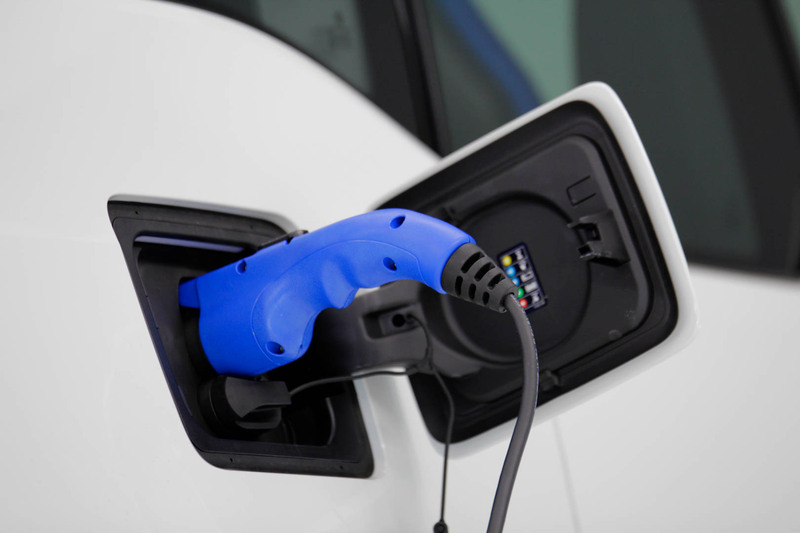 eMotorwerks is rapidly becoming one of the largest suppliers of electric vehicle charging stations, and after using their products, we understand why. One of the biggest advantages eMotorWerks has over the competition is their JuiceNet platform, that allows customers to view their charging history, easily calculate exactly how much their EV is costing to charge, start/stop a charging session and view real time energy stats such as line voltage and the current energy draw of the vehicle. All of this info is viewed in a handy app on the owner’s smartphone. While their JuiceNet app is a huge advantage over much of their competition, there’s a lot more to like about eMotorWerks. They offer four different 240-volt, level 2 charging stations. Their most popular station, and the one that we’ve been using, is the JuiceBox Pro 40. 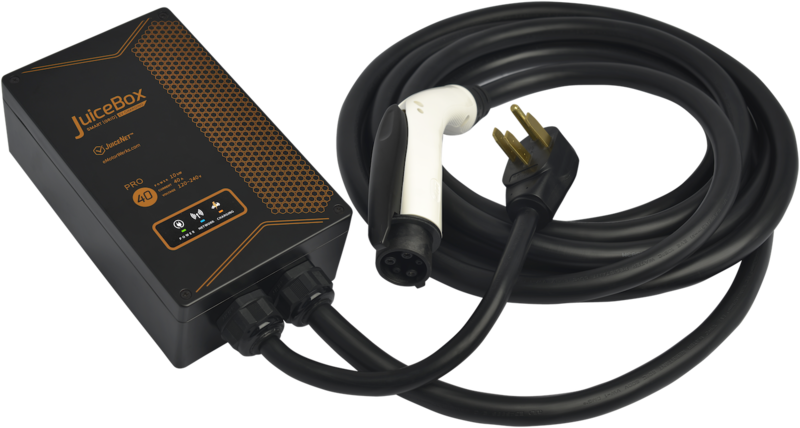 The JuiceBox Pro 40 can deliver up to 40 amps of power, and that is much more than any current BMW can accept. So why would you want a charging station that delivers more power than your car can accept? Well first of all, we need you to know that you can’t damage your car by plugging into a more powerful charging station, because the car always decides how much power it will accept. This is true for all makes and models of electric vehicles, not just BMWs. Secondly, getting a powerful charging station may not help you today, but it will in the future. Electric vehicle charging is getting faster all of the time, and in a few years, you may get another EV that can accept more power than your current EV can. For this reason, we recommend getting a charging station that is at least 32 amps, preferable 40. This way, you won’t have to spend another $600 in a few years if you want to charge your next EV faster. If you’re buying a home charging station now, get one that’s powerful and therefore future-proof your investment. 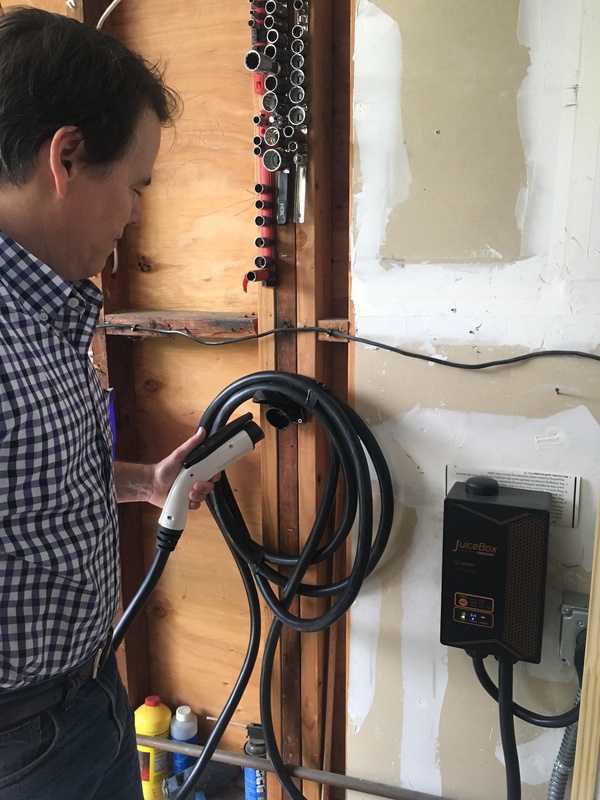 Some other features we like about our JuiceBox Pro 40 is that it comes standard with a 24-foot cable, which allows the user to reach just about anywhere in a typical garage. Many other brands offer a 16-foot cable standard, and charge extra for a longer one. 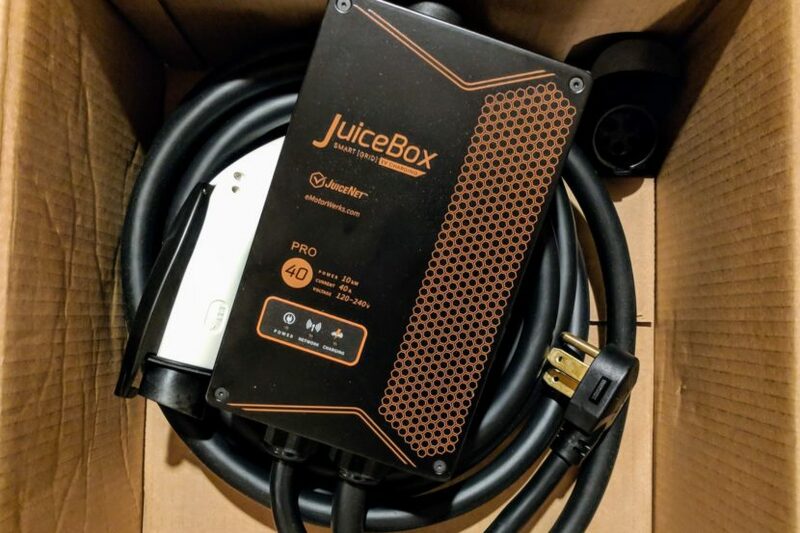 The JuiceBox is also a plug-in charging station, which can reduce the installation cost, and also allows the unit to be portable. Portability can be very useful, if you have a second home or want to take the charger with you on a long road trip. 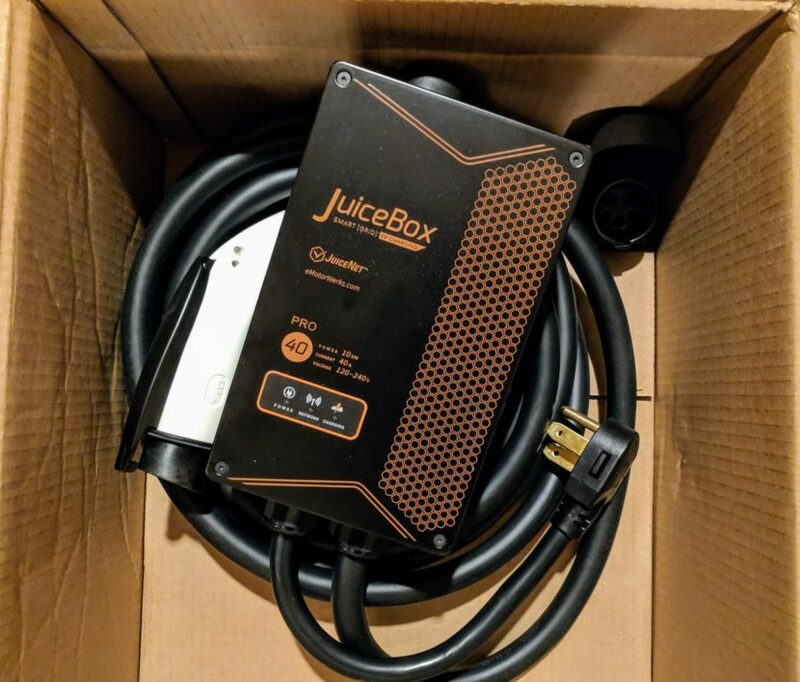 The JuiceBox Pro 40 is currentlyavailable on eMotorWerks website for a reduced price of $579.00 (it previously sold for $619.00). There’s also a JuiceBox Pro 40 “Lite” model that retails for $499.00. This unit has the same power and features of the Pro 40, but doesn’t have all of the smart charger features available through the JuiceNet app. It’s a great deal if you want the power and portability of a JuiceBox, but don’t necessarily want to use all the smart charger features. For those customers who say they can never have enough power (we are talking about BMW owners after all!) there’s the JuiceBox Pro 75. Priced at $899.00, this charging station can deliver up to 75-amps of power. This charging station may be a little overkill for BMW EVs, as currently only Tesla offers vehicles that can accept this much AC power. Will BMW’s future EVs accept 75 amps? We honesty don’t know, but with larger batteries and longer ranges, it does make sense to allow faster charging. Rounding out the JuiceBox line is the JuiceBox Pro 32. Offered for $549.00 it comes with all of the hardware and app features of the Pro 40, but it is currently only available as a hard-wired unit. At $549.00 it compares very favorably against competitor’s 32-amp stations. However, we personally think it’s well worth the extra $30 to go for the Pro 40, and get the extra power. As mentioned above, we’ve been using our JuiceBox Pro 40 to charge a BMW i3 for a few years now, and it’s performed flawlessly. The app is a great tool for any EV owner to have simply because it records all of your charging session history and calculates how much your car costs to charge. All of the other features, like Amazon Alexa connectivity are really just a bonus to us. Having the charging records available is really useful, and now that we’ve had that feature, we wouldn’t want to go back to charging our EV without it. The electric vehicle charging market is relatively new and rapidly expanding. Whichever model you choose to buy, make sure you do your homework first. There are new companies popping up all of the time, many of which have no proven track record, are selling units that haven’t been properly tested and safety certified, and many might not even be in business long enough to honor the warranty that they come with. Here at BMWBLOG we’ll continue to monitor the market and report on products that we feel BMW electric vehicle users will benefit from.